Stylistically, the amount that Angel Olsen has matured between 2012's Half Way Home and Burn Your Fire For No Witness, out February 18th, is remarkable. She's fleshed out her haunting folk ballads with the help of a full band and incorporated a whole bevy of new sounds as a result. Also remarkable is the fact none of Olsen's poetic songwriting was lost in this increasingly chaotic shuffle. Listen to the stunning Burn Your Fire For No Witness above, courtesy of Spotify. In very basic terms, the record is half quiet, and half loud. Perfectly illustrating this are its first four songs -- the first and fourth being drumless slow-burners, and the middle two rocking pretty hard -- that somehow gel, thanks to the through-line present in Olsen's biting lyrics. She's clearly a little pissed off, a little lonely and a little dejected, which isn't that rare of an emotional cocktail, but the way she gets that across to us is wholly unique. A little over a minute into opener "Unfucktheworld," we get the line: "I wanted nothing but for this to be the end, for this to be a tight and empty hand," a mixture of relief and sadness at the close of a relationship. It's been over half a century since the first unabashed "breakup album," with many, many terrible albums following suit, but Olsen does things, as the creator of that format once put it, her way. One of the album's standout tracks is "White Fire," a song that, seemingly, everyone and their mother's indie music blog has compared to another guy who knew a thing or two about crafting heart-shattering breakup music: Leonard Cohen. Sure, the song's intro sounds similar to Cohen's "Avalanche," but come on guys, some original thoughts would be nice. Whatever it sounds like, whatever its influences are, "White Fire" will get under your skin and stay there -- a difficult feat for such a bare-bones song in 2014. Part of Olsen's charm is making folk music sound new again without varnishing it with a poppy Mumford sheen. Her voice is distinct, her lyrics are creative yet digestible, and her new, full-band sound is a nice antidote to her (admittedly great) solo tracks, which might send you into a deep depression if allowed an entire second album to themselves. 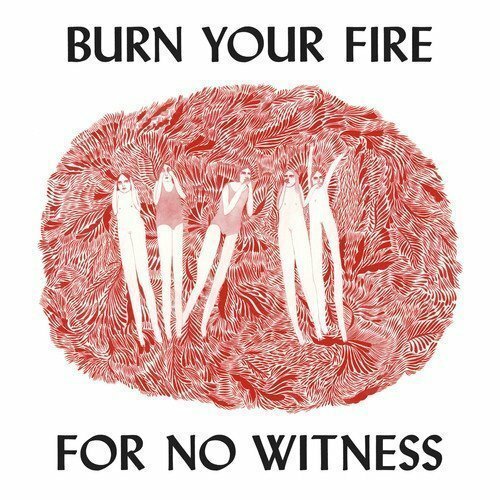 Burn Your Fire For No Witness is available for preorder from Jagjaguwar's official webstore. Watch the video for "Hi-Five" right here on Zumic, and check out the album's tracklist below.